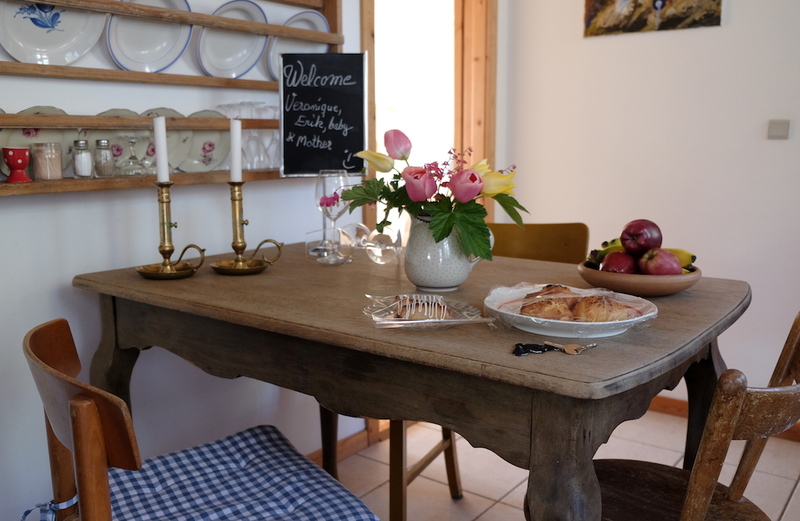 I booked a B&B for the two nights of our 3-day trip to Møn Island, where we went to see the white cliffs and the beautiful churches, among others. The month of May marks the end of the low season; the number of visitors starts to increase, and the accommodations are quickly fully booked. That being said, we found a nice little spot: Karin and Erik’s Fuglehavegård Bed & Breakfast. This lovely B&B is located near the town of Hårbølle, in the southwest of the island, a few kilometres from the gorgeous Fanefjord Church. It’s at the opposite of the cliffs (Møns Klint) but they are only 30 minutes drive from the B&B. The advantage of staying there is to take the opportunity of discovering the western side of the island. The B&B is charming, decorated with vintage items and furniture. The accommodation includes a bedroom, a small kitchen, a bathroom, a living room with a sofa-bed for extra-bedding, and an access to the patio. Through the bedroom windows, we can see the henhouse, and behind an endless pasture. When the sun sets, it gives a beautiful golden colour to the place and a peaceful atmosphere. The little neighbours are rather quiet, despite a flighty rooster flirting with the chicks, and showing off to impress them. We said that he would have deserved his own hashtag #chickstoo. The ladies, as for them, are busy with supplying the B&B’s breakfast with fresh eggs. We couldn’t try it as our hosts were out during our stay, but it has good reputation according to the guest book. Karin, the lady of the house, speaks English. It seems you guys really did a great deal over the three days. The B and B looked absolutely charming as did the painting of the church interiors. Veron how did we know you would sniff out a delicious bakery!